Redmi Note 7 First Sale Result: Sold Out in 8 Minutes and 36 Seconds - Playfuldroid! 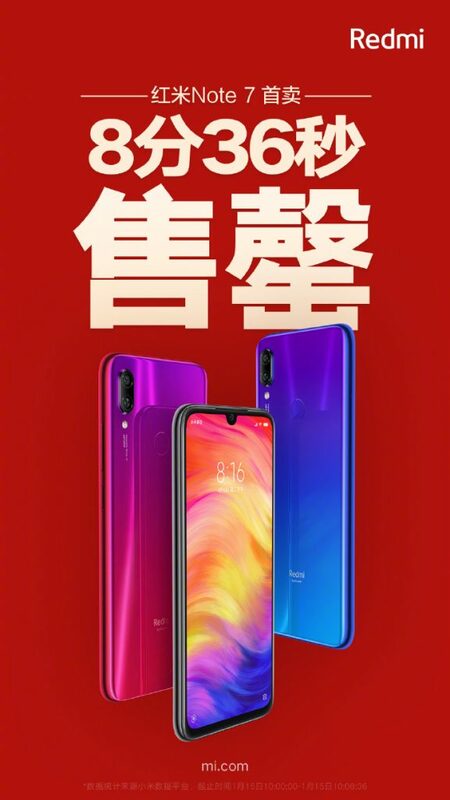 The first sale of the Redmi Note 7 was carried out in China today at 10 AM. Xiaomi CEO Lei Jun has confirmed through a Weibo post that the Redmi Note 7 was sold out in its first sale in 8 minutes and 36 seconds. The next sale of the smartphone will take place on Jan. 18 at 10 AM in China. The Redmi Note 7 comes in three color choices such as Fantasy Blue, Twilight Red and Black. The base model of the phone features 3 GB of RAM and 32 GB of storage. The second variant of the phone has 4 GB of RAM and 64 GB of storage. Its highest model is packed with 6 GB of RAM and 64 GB of storage. These models are respectively priced at 999 Yuan ($147), 1,199 Yuan ($177) and $1,399 Yuan ($207). The Redmi Note 7 is the first phone to come with features like glass body, waterdrop notch screen and USB-C port. It features a 6.3-inch display, Snapdragon 660, 48-megapixel Samsung GM1 sensor + 5-megapixel dual camera, 13-megapixel selfie shooter and 4,000mAh battery. After the Spring Festival in February, Redmi will be introduced the Redmi Note 7 Pro smartphone in China. The handset will be featuring a Sony IMX586 48-megapixel sensor instead of Samsung GM1 sensor.